April 2019 has been declared Grange Month by National Grange President Betsy Huber. Community Granges throughout Connecticut are encouraged to participate in the month-long celebration by opening their doors to the public for family-oriented events focused on the contributions of the Grange in their communities. Community Granges are encouraged to celebrate Grange Month with open houses, lectures and programs, citizens’ awards, service projects, community displays, traditional pot-luck suppers and more, and to incorporate the 2019 theme into their celebrations. Don’t wait for the last minute to put an event together. The time to start planning is now. National Grange will soon be posting information on their website and on Facebook to help Granges with promoting Grange Month. 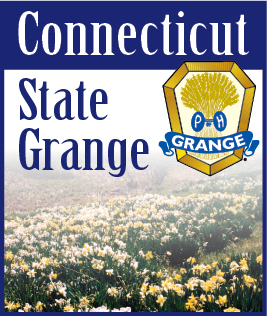 The Connecticut State Grange Public Relations Committee will also be posting information on the CT State Grange website and Facebook to help Connecticut Granges in their Grange month promotions. If you need help promoting your Grange’s Grange Month events - such as writing press releases and articles,designing posters and more - the PR Committee is just a an e-mail away!